You’re finally ready to get that home theater all set up and the anticipation is continuing to build! 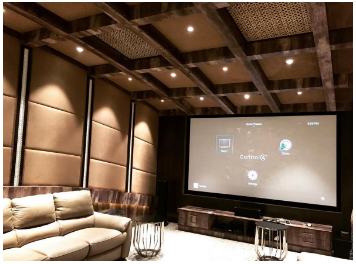 The idea of having a fully immersive cinema experience right in the comfort of your home is enough to make anyone quiver with excitement! There’s just one main question that is eating away at you: Where do I even start?! Play copycat and adapt the big screen to your personal home theater! 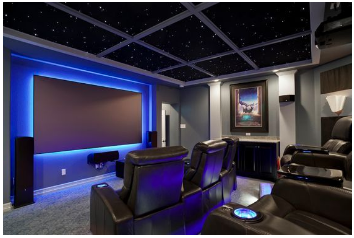 Invest in track lighting, wall accents, and the perfect projection screen to showcase your next big cinema showing. Looking to kick it up a notch? Seek out movie poster frames and manifest your own walk of stars! Take inspiration from the real movie theater and spring for the bigtime – you won’t regret it! In this home theater, the TV is the main centerpiece that pulls the entire home theater set-up together. The big screen captures your attention, radiating your gaze from the inside out. The muted color palette emphasizes the screen beautifully with bonus points for the pop of color paintings on the back wall! Think outside the box and bring the great outdoors indoors! 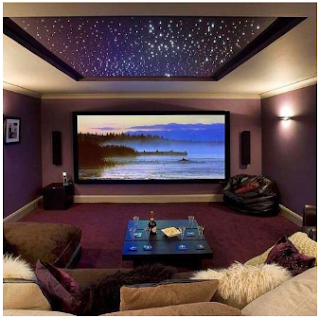 Create the perfect staycation spot right inside your home with a stargazing option built into the ceiling. Accent the space with warm colors and cozy pillows to create the ultimate, relaxing ambiance. Lighting can make or break your new man cave or home theater! Remember, it’s all about creating an established experience to limit distractions. Keep in mind that suspended or hanging fixtures and lamps could cause uneven lighting or reflections on the screen. If it’s in your budget, go for dimmable and remote-controlled lights. For a bolder look, try adding LED lights to frame the screen and fiber optic lighting strips around the floor or baseboards. 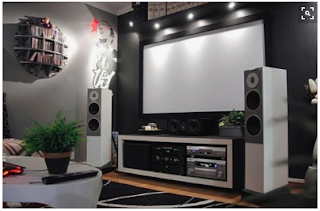 Building a home theater around the comfort of the seating is a great place to begin. 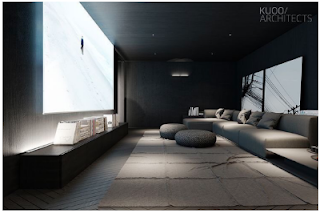 An in-home theater viewing experience is amazingly enhanced with an organized seating scheme. Choose a seating style and design that fits your needs and desires for the space. If you’re going for the traditional cinema theme with stadium seating and dramatic curtains, then plan to search for theater seating that is traditional as well. However, if your home theater is a smaller affair and more of a media room, skip the dramatic experience and consider more traditional seating such a wrap around sofas complemented with 1-2 arm chairs. You don’t need a four-story mansion to incorporate a great movie room! Even a small space can be transformed – all with the help of good shelving and storage! It can be a challenge to navigate cramped quarters, making utilization of every available inch more important than ever. Minimize clutter and avoid furniture that refuses to conform to corners. Ditch the bulky TV and accompanying stand for a mounted TV and counter space that doubles as a shelf to accommodate your gaming systems and extra storage. 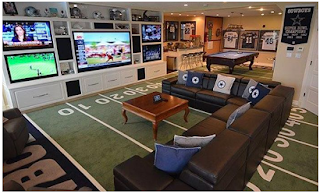 Watch all the games all at once in this man cave built for every sports fanatic! Complete with a bar, pool table, and football field carpet, this man cave gives every home theater a run for its money. 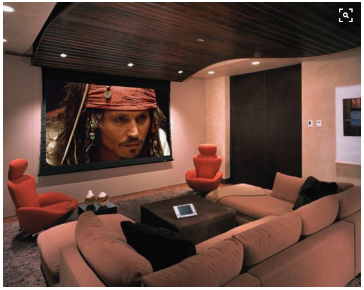 Every in-home theater should be catered around your desires and needs for a personal getaway. Make it as unique as you!